TEXAS (NBC OLYMPICS) -- Crazy: an adjective Seun Adigun hears every day. Crazy for trying to become the first Olympic bobsled driver from an African nation. Crazy for training for the Winter Olympics—in Texas of all places—while pursuing a Doctor of Chiropractic degree. Like many millennials, Adigun discovered bobsled by watching the movie “Cool Runnings” as a child. But she did not see the sport on television until the 2014 Winter Olympics. She tuned in because she knew all three push athletes on the U.S. women’s bobsled team—Aja Evans, Lolo Jones and Lauryn Williams—from track meets. Adigun and Jones both competed in 100m hurdles at the 2012 Summer Olympics, while Williams won a 4x100m gold medal in London and Evans attended a rival high school in the Chicago metropolitan area. Inspired by the track-to-bobsled converts, Adigun decided to try bobsled for herself. She earned a spot on the U.S. national team in 2015, with just three months of training. She had success during the 2015-16 season, claiming a gold medal on the lower-level North American Cup circuit and an invitation to compete on the top-level World Cup circuit. Unlike most of her teammates, Adigun did not reside full-time at the U.S. Olympic Training Center in Lake Placid. She lived in Texas while pursuing both a Doctor of Chiropractic degree from Texas Chiropractic College, on a full ride from the FICS/Atlanta 1996 Olympian Scholarship Program, as well as a Master of Science in Exercise and Health Sciences from the University of Houston-Clear Lake. Proudly describing herself as the “coolest nerd you’ll ever meet,” the aspiring chiropractor and exercise physiologist often delighted teammates with spontaneous singing and dancing routines. To stay active in Texas, Adigun built herself a makeshift wooden bobsled. She calls it the “Maeflower” in honor of her stepsister Amezee, nicknamed “Mae Mae,” who died in a car accident in 2009. With no blueprint, the “Maeflower” came together after numerous rounds of trial and error. “It’s now a nearly perfect simulation of what we actually do on ice,” said Adigun, who pushes the “Maeflower” on a running track, often in front of an audience of perplexed onlookers. She occasionally fantasized about competing in bobsled for Nigeria, the country she represented in track at the 2012 Olympics. She was born in Chicago, but both of her parents were born and raised in Nigeria, where she estimates that 75 percent of her family still lives. She fell in love with the country by visiting every year or two. 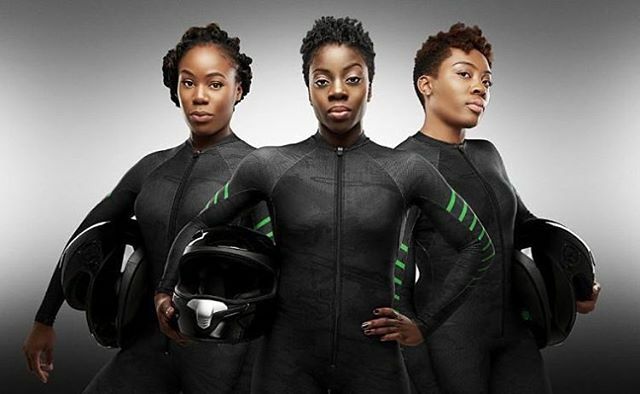 But Nigeria did not have an active bobsled program, and had never even sent an athlete to the Winter Olympics. Adigun decided then that she would accept the ambitious challenge of creating a Nigerian bobsled program from scratch. She first reached out to her U.S. coaches. She explained that she felt loyal to the U.S. program, but believed she could empower a nation by competing for Nigeria. U.S. head coach Brian Shimer outlined the monumental obstacles, but provided his full support. Adigun then recruited her push athletes: Akuoma Omeoga and Ngozi Onwumere. Adigun met Omeoga, who sprinted for the University of Minnesota, through a mutual friend. Onwumere was a sprinter at the University of Houston, where Adigun served as an assistant track and field coach. Omeoga and Onwumere agreed to try the unfamiliar sport after just one meeting with Adigun. As three recent college graduates with minimal savings, they desperately needed money to fund their training. They started a crowdfunding campaign with the slogan, “We proudly welcome winter to Nigeria,” a country with an average temperature of 77 degrees Fahrenheit in its coldest month. The crowdfunding campaign received attention from international media outlets. Even John Boyega, the actor best known for playing Finn in “Star Wars: The Force Awakens,” shared a picture of the Nigerian bobsledders with his millions of followers on Instagram. Money started rolling in, but not enough to initially afford a new sled and runners, which can cost upwards of $50,000. Instead they continued practicing on a running track with the “Maeflower,” and competed with a rented sled. They made their competitive debut in a North American Cup race in Park City on Jan. 9, 2017, less than six months after forming the Nigerian team. They finished last, a distant 12.26 seconds behind the first-place team. The next day, 6.68 seconds separated them from first place. Adigun, who has fulfilled her Olympic eligibility requirements and is expected to qualify for the 2018 PyeongChang Olympics via the quota spot reserved for a country from a non-represented continent, is realistic about her expectations. In her first five lower-level races, she was either the last or next-to-last finisher. She hopes to have completed 100 career bobsled runs as a driver before arriving in PyeongChang. By comparison, U.S. driver Elana Meyers Taylor estimates that she tallies 150-200 runs per year. “I am one of the most novice drivers on the track,” admitted Adigun, who will be 31 during the 2018 Games. Her main goal is for the Nigerian bobsled program to survive so that future bobsledders will not be described as, well, crazy.